Damon, In-Ovation-C, Smart Clip, Speed. Please review the video clips. Unlike conventional fixed appliances, self-ligating appliances utilise an integral clip mechanism within the bracket rather than an elastic in order to secure the archwire. Though self ligating brackets have been used in orthodontics for over 70 years, recent advances in bracket technology and the development of new bracket systems have resulted in greater interest in their use. Manufacturers have engaged in very intensive marketing campaigns and have claimed many advantages to using these self ligating brackets. Including that the orthodontic treatment will be finished sooner and that the patient will get a better result by using these brackets. However the scientific evidence certainly does not support these claims. The rather minor advantage of these bracket systems is that though the number of visits will be the same as for conventional brackets each visit maybe a minute or two shorter. Many types of self-ligating brackets are available. 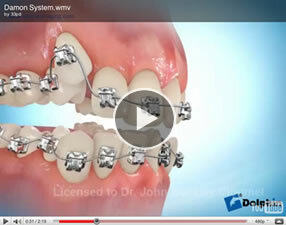 The Damon appliance and the In-Ovation appliance are well known due to intensive marketing. These differ in having a different clip mechanism to secure the archwire. To date, there is no scientific evidence that one type of bracket is better than the other, or that either is better than conventional brackets. 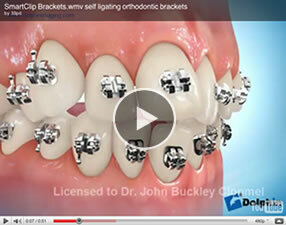 Dr Buckley is happy to use self ligating brackets for your treatment if you so wish. If you wish to follow some of the scientific research on these brackets .